Reds lost their last pre-season game 2-1 away to National League South side Whitehawk. Crawley took an early lead through Gwion Edwards which was cancelled out after 18 minjutes by Danny Mills. Whitehawk’s Sam Deering scored the winner early in the second half in a move which looked to be offside. Crawley included four of their five new signings made this week in their starting line-up, with loanees Liam Donnelly from Fulham playing at right back and Newcastle United goalkeeper Freddie Woodman. Roarie Deacon and Lee Barnard, who signed one-year contracts on Monday, started up front. Whitehawk fielded two ex-Reds in the legendary Sergio Torres and Scott Neilson. 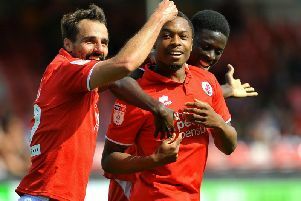 Gwion Edwards gave Crawley the lead after just six minutes when he hedead Bobson Bawling’s cross firmly into the net from the right of goal. Danny Mills soon put Whitehawk level after 18 minutes when he beat the offside trap to beat Woodman for 1-1. Whitehawk enjoyed a good spell after they, scored and Jake Robsinson, had forced Woordman to make a save with a powerful 25-yard shot. Jimmy Smith released Deacon for Crawley who crossed towards the awaitng Simon Walton, only for home keeper Craig ross to cut-out. As the first half came to ac close, Russ also denied Gwion Edwards who has a useful attempt to score. Whitehawk came out the stronger for the start of the second half and threatened to score when Mills turned and shot but lifted his effort overv the bar. However the Hawks soon took the lead in controversial circumstances when Jake Robinson supplied Sam Deering who put into the back of the net. However the assistant referee had already flagged for offside, but the referee waved play-on. Reds boss Mark Yates came on the field to complain to the ref, but the goal stood. Ross made a fine block to deny Deacon as Crawley pressed for an equaliser. Reds then made five subs at the same time as Matt Harrold, Jon Ashton, Shamir Fenelon, Conor Henderson and Lewes Young all came on after 72 minutes to replace Joe McNerney, Luke Rooney, Edwards, Deacon and Walton. REDS: Woodman, Donnelly, McNerney, Bradley, Bawling; Smith, Walton, Rooney; Barnard, Edwards, Deacon. Subs: Preston, Fenelon, Young, Henderson, Harrold, Ashton, Summerfield. Whitehawk: Ross, Arnold, Hills, Ijaha, Rose, Mendy, Deering, Torres, Robinson, Mills, Neilson.